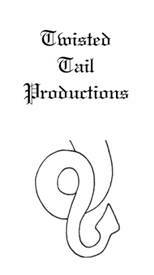 See Page 1 below for Twisted Tail Productions™ on-line orders. See Page 2 for Twisted Tail Productions™ snail mail or email orders. The following products below are available on-line by clicking the link at the bottom of the page. The Original Hawkwood Fantasy Faire edition of the Twisted Tail Theartre Playbook. This playbook is a compendium of 21 playlets and a one act play for 8 -12 characters. 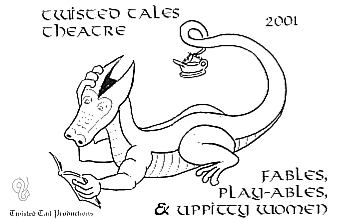 Plays are developed to be performed at medieval, renaissance, or fantasy festivals. Stapled book format. 50 pp. Black and White. 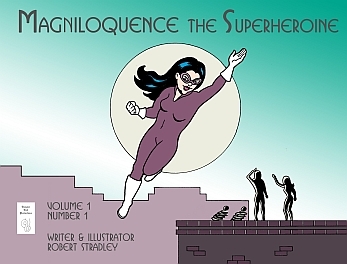 Magniloquence the Superheroine Vol 1 No 1. 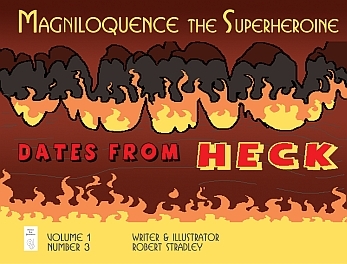 This is the first comic in the series featuring the heroine Magniloquence the Superheroine from the hit webcomic. 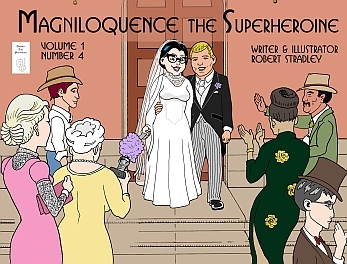 Magniloquence the Superheroine Vol 1 No 2. This is the second comic in the series featuring the heroine Magniloquence the Superheroine from the hit webcomic. Stapled comic book format. 28 pp. Full color. Magniloquence the Superheroine Vol 1 No 3. This is the third comic in the series featuring the heroine Magniloquence the Superheroine from the hit webcomic. Magniloquence the Superheroine Vol 1 No 4. 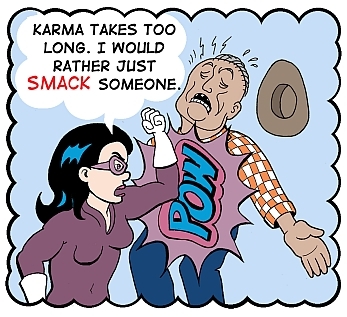 This is the fourth comic in the series featuring the heroine Magniloquence the Superheroine from the hit webcomic. Stapled comic book format. 32 pp. Full color. 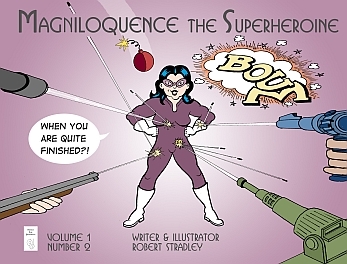 Magniloquence the Superheroine Volume 1 Compendium. This is a trade compendium comprising Magniloquence the Superheroine Volume 1 incorporating comics 1-4, including covers. Magniloquence the Superheroine Holidays #1. This is the first compendium of holiday panels featuring Priscilla, Aimée, Janusc, and their friends from the hit webcomic Magniloquence the Superheroine. This compendium also includes pinups of the major characters and the swimsuit edition at Wonder Lake. .
Stapled comic book format. 36 pp. Full color. 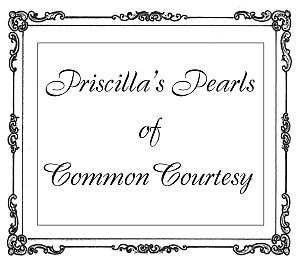 Priscilla's Pearls of Common Courtesy #1. This is the first compendium of PPCC panels and Interludes featuring Priscilla from the hit Magniloquence the Superheroine webcomic. Priscilla dispenses advice about today's problems with manners in a rare combination of tact, common sense, and humor in the conservative setting of a small town in Texas. Stapled comic book format. 36 pp.Full color.. 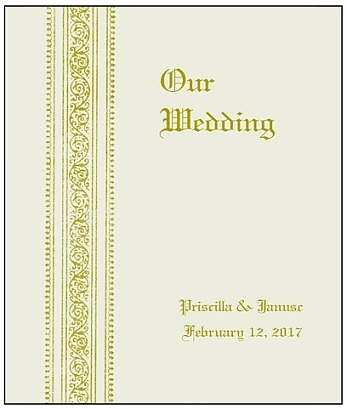 This is a comic featuring the wedding of Priscilla and Janusc from the hit webcomic Magniloquence the Superheroine. Magniloquence The Superheroine tee shirt iron-ons. Choose from Magniloquence, Ampére, Kinematic Man, and Six Shooter. 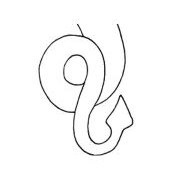 Twisted Tail Theatre Leather Medallion. 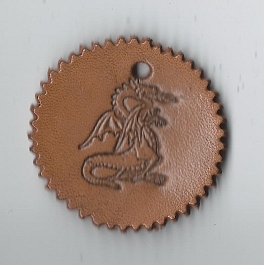 A TTT medallion which may be given to each of the players of Twisted Tail Theatre as a keepsake. Particularly useful for RenFaire audience participants.